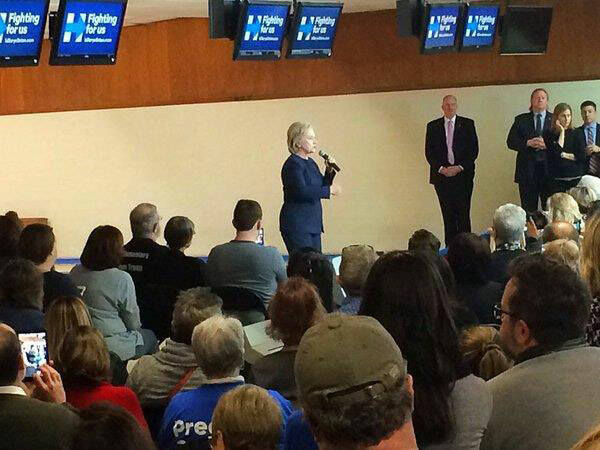 Democratic presidential candidate Hillary Clinton visited a bowling alley in Adel this morning. The business was recently purchased by a young man Clinton met last spring. Clinton told the crowd the roundtable chats she held nine months ago have shaped her campaign message. Clinton spoke for more than 40 minutes. She blasted Republicans and barely mentioned her two rivals for the Democratic Party’s presidential nomination. 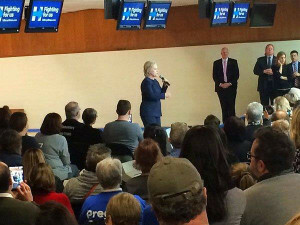 Clinton’s voice rose as she criticized “price gouging” on prescription drugs and American companies that establish a corporate presence in another country to avoid paying taxes in the U.S.
Clinton has no other public events in Iowa today. She’ll campaign in Newton and Keokuk tomorrow.